Black Smoke Matters is a group of truckers aiming to make a change. Their goal is to make trucking better for truckers. From a lack of parking to a repeal of the ELD mandate, BSM wants to make public what many truckers have been discussing for years. Over 26,000 truck drivers are planning to make themselves heard this April 12th. Let’s review what those issues are, the protest itself, and what the other 1.6 million truckers are saying about it. We’ve had 2 years of the ELD mandate. Although the mandate was implemented to prevent truckers from unsafe driving, the actual effect is the opposite. Drivers are more crunched on time and stressed than ever before. The ELD mandate has backfired, forcing drivers to rush and push themselves into unsafe situations. And to make matters worse, ELDs can be hacked, as Black Smoke Matters has pointed out. The ELD mandate has also lowered the pay for drivers because of detention time. Even when truck drivers are sitting idle because they’re getting unloaded, that ELD clock is still tick… tick… ticking. This problem stems from the HOS 14-hour rule. Because truckers can only be on-duty for 14 hours a day, they are technically on-the-clock while waiting around. And with the ELD mandate, there is no flexibilty for scheduling. Truck drivers feel that there’s no need for a babysitter to check over their shoulder to let them know when bedtime is. 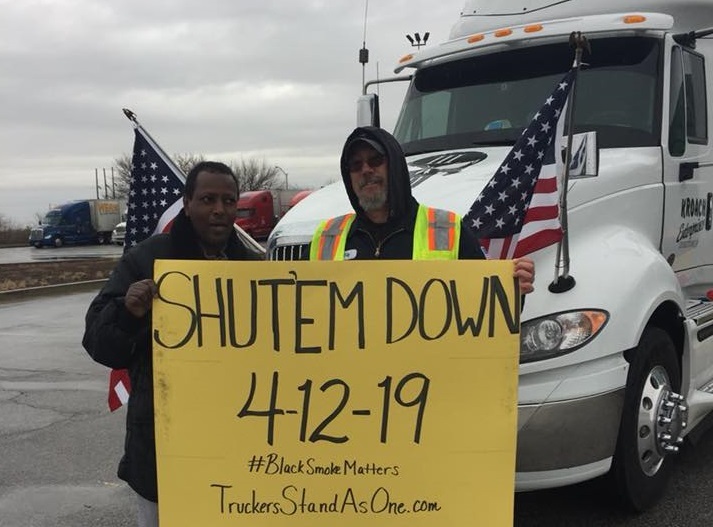 Black Smoke Matters wishes to raise awareness by shutting down all trucking on April 12th. But their plan is not simply to strike. They want to park directly on highways across the nation. Not all truckers agree with their methods. Some truckers are voicing concern about the upcoming protest. Naturally, a shutdown on highways across the nation will delay important shipments. Some of which could be life-saving medical supplies. Some truck drivers who see this move as dangerous are opting to take off that day or simply refuse to work. Other truckers argue that a lack of unions give truckers no other recourse – a trend of desperation seen across the country. Additionally, the act of preventing goods from getting to their destination can drive prices up. A great example is the trucker strike of 1973. During this event, the price of oil drastically shot up. But the tactic did work, and truckers became visible to the government. Nobody knows the repercussions of the protest, but we’ll find out on April 12th. Nevertheless, we will find out first hand April 12th.